Better late than never, this Admin was on vacation in beautiful Oregon. Carla Gillis of the online magazine Now reports on her experience at the Way Home Festival, a three-day music blitz held July 22, 23 and 24 at Burl’s Creek Event Grounds, Oro-Medonte, Ontario. Gillis described the scene as tens of thousands of people spread out across the massive grounds. “We got three hours of him, backed by the flawless Promise of the Real, and every moment was glorious, even all those heavy-handed songs about Monsanto and Starbucks and GMOs and pesticides from his new Monsanto Years album. In a T-shirt that said ‘Earth,’ Young smartly waited for close to an hour before bringing them in, first serving up the perfect soundtrack to an outdoors concert under a half moon: heart-tugging renditions of Helpless, Winterlong, Out On The Weekend, Cowgirl In The Sand. 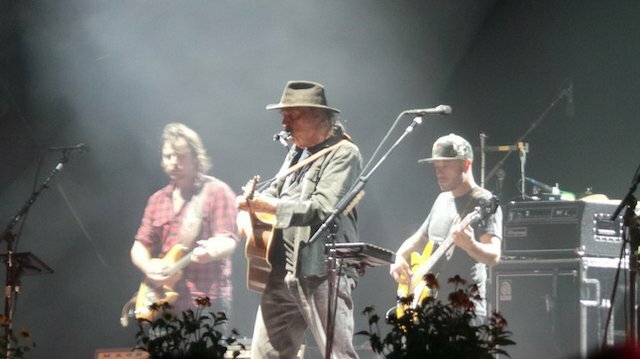 “And when the eco-crusade began, Young’s passion was so apparent, so genuine, that it made you think about how although his motivation for writing music may have shifted away from rustic love balladry over the last couple of decades, he’s always going to give us honest, stark and impassioned tunes about his current obsessions. And making the world a better place couldn’t be a more admirable one. “Humour laced the set – ‘Your organic cherries are absolutely perfect'” he said, before throwing a bunch to the massive crowd – and his guitar solos were louder, wilder, more frequent and ferocious than I’ve ever witnessed, especially the epic roaring one that came at the set’s end, long after A New Day For Love, Down By The River, Everybody Knows This Is Nowhere, Rockin’ In The Free World. Pure magic.